Enjoy your Patio Mosquito-Free! 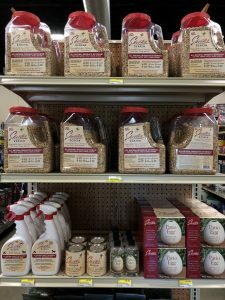 Find the right Skeeter Screen products for you and your family at Argyle Feed & Hardware. We have Skeeter Screen granules, spray-on and Patio Egg for an easy, safe and effective way to help deter mosquitoes and other biting insects from your patio and other outdoor living areas as well as yourself! The Scent Shop manufactures all Skeeter Screen products that have the amazing proprietary formulation that protects you and your whole family. This DEET FREE Scents of Nature formulation is derived from natural essential oils. It is safe for pets and the entire family with a pleasant floral scent people like and biting insects hate. DEET causes memory loss, headache, fatigue, muscle and joint pain, shortness of breath and in some cases, neurological damage. When you spray it on skin it gets absorbed, pumping through your nervous system. Skeeter Screen Oil, 4 fl. oz. Scents of Nature formula is an easy, effective and safe way to deter mosquitos from patios, balconies, decks and other favorite hiding places. Skeeter Screen Personal Spray is DEET and pyrethrin free and contains no insecticides or herbicides. The convenient pump spray is biodegradable and earth-friendly. This spray can be used on both skin and clothing. It is non-staining and not oily or greasy and lasts for hours. Don’t let annoying insects ruin your outdoor activities. Drive bugs away and keep them away with Skeeter Screen Personal Spray – It Really Works! An easy, effective and safe way to deter mosquitos from patios, balconies, decks, garages and other favorite hiding places for 24 hours a day, 7 days a week. 8 fl. oz. – 237 ml. Every Skeeter Screen Diffuser comes gift boxed with complete instructions for use and interesting yet little-known facts about mosquitos. It’s easy to use. Simply open the bottle, place the sleeve on the neck of the bottle and insert the willow reeds. The oils will be absorbed up through the reeds then will be released naturally into your environment for up to 4 months of continuous diffusion. The Skeeter Screen Diffuser is designed for both outdoor and indoor use. The pleasant floral fragrance is completely safe and will not harm beneficial insects. This entry was posted on Friday, June 22nd, 2018 at 12:05 pm	and is filed under Garden, News & Updates. You can follow any responses to this entry through the RSS 2.0 feed. Both comments and pings are currently closed.